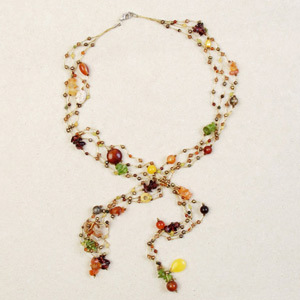 Sirada dresses this spectacular necklace with multiple colors. 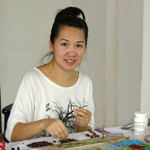 She handcrafts the necklace in various strands that can tie at the center, threading pearls, carnelian, peridot, citrine, jade, quartz, garnet, howlite, jasper and glass on rayon threads. 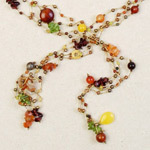 Materials: Pearls, carnelian, peridot, citrine, glass, jade, quartz, garnet, howlite, jasper, rayon and stainless steel.